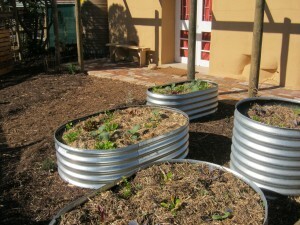 RainQueen Tanks were happy to be able to sponsor garden beds for the Rocklands Urban Abundance Centre in Mitchell’s Plain. A demonstration home using green building techniques, the home shows what could replace a typical RDP home as it is built within the same budget as a RDP home and using the same amount of space. Features include a composting toilet, solar water heating, solar cooker and bicycle powered washing machine. Gutters connect to two rainwater tanks. The gardens are full of indiginous plants as well as fruit trees and berry bushes. Vegetable gardening is concentrated in RainQueen raised garden beds, which offer a simple solution to poor sandy soils. Filled with compost they were planted up and in production in a few weeks. They add a neat, ordered appearance to a vegetable garden and have made a feature of the front garden and entrance way. This raises the profile of vegetable gardening and shows it’s importance, it’s not an activity that needs to be hidden in the far corner of a garden.